Happy spring, UMD! After a long winter, with some unpredictable weather toward the end (including a few VERY misleading warm days), we think it’s safe to unpack your shorts and finally say that spring has sprung. In Unwind’s first print issue this semester, we’ve compiled a wide variety of human interest stories. And, in honor of national Women’s History Month that took place this March, we’ve featured several stories that highlight intelligent, admirable and noteworthy women on campus and everything they’re doing from volunteering at Terp Farm to having her own radio show. Whether you choose to read this quickly in between classes or lounging in the sun on the Mall, we hope you’ll like this issue just as much as we do. 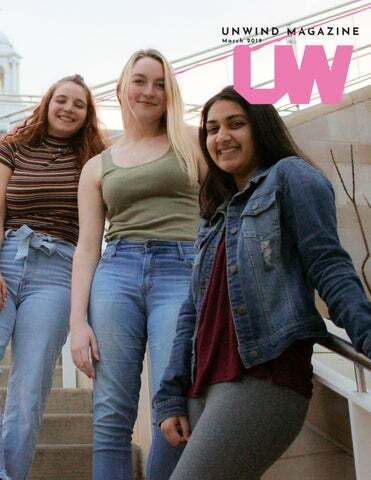 UNWIND is an entertainment news magazine published by and for University of Maryland students. It is sponsored by Media, Self and Society Productions and was founded in 2011. The stories are from a mix of staff writers and contributing writers who attend general interest meetings to volunteer to report stories or pitch ideas. To honor International Women’s Month, we featured and interviewed impactful young women students at UMD. These women are changing our community in big ways, and we are all inspired by their strength and spirit. Meet some of the women of UMD. “I think it’s really important to have role models and other women encouraging and empowering each other, because sometimes all you need is someone else telling you that you can do it. That little push is enough to spark the already present potential someone has. This is especially important for women in STEM just because there’s always been a gender divide. Knowing that there’s more women than men in medical school currently, shos that women have always had the capability. Now, with encouragement and a support system, it’s amazing what we can do. “I chose to go to school to become a speech-language pathologist (SLP) because I am genuinely intrigued by what they do and I’ve seen the satisfaction it gives to people and how much it helps and that’s something I’ve always wanted to do–help,” said Jill Doherty, a hearing and speech science major and linguistics minor at UMD. Doherty was exposed to speech pathology at a young age. Her babysitter’s son was born with a speech impediment, and she would participate in speech games with a private pathologist as an extra. It was from this point where her passions for hearing and sciences and helping others grew. “I’ve always been one to offer a helping hand when one is in need, and I grew to love seeing the satisfaction of one finally being able to get something, even if it’s a small task,” said Doherty. At UMD, the Hearing and Speech Science program (HESP) is quite small, with approximately 175 people in the program. event operations. “The biggest challenge for board was probably damage control since we had a few incidents that we had to think fast on our feet for, but we ended up taking care of it all,” Akshaya Ganesh, Mayuri’s event operations chair, said. t’s been twelve years since Netflix revolutionized the way the world watches TV. The streaming powerhouse, which now boasts 139 million subscribers globally, has grown out of its roots as a DVD mailing service to weave its way into the fabric of modern pop culture. And it’s not going anywhere, thanks to the popularity of the company’s original programming. Netflix began releasing its first self-commissioned shows in 2013 with “Lilyhammer” and “House of Cards,” the latter earning eight Emmy nominations after its first season. the latter earning eight Emmy nominations after its first season. Today, Netflix can count on the cult followings of shows like “Stranger Things,” “Queer Eye” and “13 Reasons Why” to keep viewers coming back. Binge-watching brought Netflix onto the world stage. But how important is the site to UMD students? What shows and movies are we bingeing, and when are we choosing to watch? I took to campus this week to find out. Of course, there were the usual crowd favorites: long-running network hits like NBC’s “The Office” and CBS’s “Criminal Minds,” are often watched on repeat. These shows don’t need to be seen in chronological order; many students described taking breaks mid-season and starting up again wherever they chose. “Queer Eye” and “Patriot Act with Hasan Minhaj,” two Netflix Originals that came into prominence last year, also had a strong following among the students I spoke to. period , Paul said this is not set in stone. If students have a good academic reason, they may be able to lease the technology for longer. Heather Adair, a PhD student in analytic philosophy, reached out to Paul last semester regarding loaning VR equipment from MakerSpace, because she was fascinated by the dilemmas with these technologies. Another purpose of the showcase is for every student to try the technology and be inspired to integrate it into real-world scenarios. Eleanna Weissman, a sophomore criminal justice major, said one idea would be to make a virtual reality experience for prisoners who have not been outside in many years, so that they can ease into society after years of unfamiliarity with the world. “I’m interested to see if/how virtual reality might be utilized for rehabilitation purposes. I want to see how immersive the VR environment is in its current state and if it can be used to help reintegrate convicts into society so they’re more prepared,” Weiss said in an email. Since the purpose of the MakerSpace is to help students become more familiar with new technology, one of Paul’s ideas is for students to think of “foldable phones” as the next big thing. “There’s some really neat looking phones that literally open up and fold. And so they basically turn a 6 inch phone into a 12 inch tablet.” After asking about how the casing would work for a foldable phone, Paul continued that “that’s what we want people thinking about, ok ‘how would I design a case for this?’” “That’s a great question for a business student, is: ‘How do I make a case?’ ‘How do I market that?’“ “For a computer science major, this thing would be like, ‘ok, how do I develop for a technology that has two different screen sizes?’” he added. “You know, so ‘how do I make a program go from this to this, when I do this?’” Paul envisions the program to go on as long as technology advances. He said that students may come in and use the technology during business hours and if they have an academic reason. The MakerSpace labs can be found on the second floor of McKeldin Library. Should college students own dogs? framework of rules that dictate how players explore and fight their way through perilous landscapes. Dice are rolled and compared to the sheets with the characters’ values for Wisdom, Strength, and so on. Most players act as their invented personas, but one player is the Dungeon Master, or DM, responsible for providing exposition, crafting a narrative and running the game. Some keep the game entirely in their mind’s eye; others set out grid maps and miniatures to represent heroes and monsters. The rest - the sagas, the tearful goodbyes and glorious victories - is entirely up to the players’ imagination and the DM’s guiding hand. “There is a lot of things I will never get to do, but seeing my players do those things and truly enjoy themselves makes it all worth it,” said senior computer science major Ryan Kendig, DM for Phillips’ group. “I get to write backstories, create lore, organize encounters, move the pieces and pawns of the world they are in however I see fit.” For students like Kendig and Phillips, their D&D sessions come regularly, premeditated and meticulous - for others, like junior Jules Allbritton-King, they are few and far between, as he juggles bioengineering and casting spells. Despite the long lulls between games, Allbritton-King still recalls his favorite moments from his campaigns. The worst roll he ever had, he said, was the last roll of his beloved warlock’s life, and the end of his first fulllength D&D campaign. With the celtic symbol for father-daughter sitting on the back of her right shoulder, Skylar Johnson, a sophomore criminology and criminal justice major, and her father decided to finally get matching tattoos that represent their close relationship. The second her father asked her about it, Johnson was already on board. “It’s like having my best friend sitting on my shoulder every day and I could not love it more,” said Johnson. After getting his heart broken in high school, Daniel Zhang, a freshman neurobiology and physiology major, got the phrase “head up, love” from the song “Stubborn Love” by the Lumineers tattooed on his left thigh. “I interpreted it as forgive and forget, be positive, and always show love and kindness to others even when they may not deserve it,” said Zhang. Showcasing a small sun on her left ankle, Emily Mountain, a sophomore secondary math education major, got this tattoo to remind herself “to find the good in every situation because it’s always there even when it’s a little harder to see.” As a firm believer that perspective directly correlates with satisfaction in life, Mountain uses the tattoo to help get her through the hard, negative times in life and focus on the joyous, positive experiences. As a spontaneous decision to start off her college experience, Amanda Baker, a sophomore psychology major, went to the tattoo parlor with her brother and decided to get a panda on the back of her left shoulder. “The panda symbolizes my nickname when I was a child and it is a nice reminder that no matter where I am, my brother is always with me,” said Baker. After continuously finding peace from looking out at the mountains, Jordan Plotkin, a sophomore environmental science and policy major, got the landform tattooed on the inside of her right foot. She was inspired to get the tattoo after spending the summer in Vermont surrounded by large, green mountains and found the ink as a way to express herself. Every tattoo has a story. From an impulsive decision to a meaningful tribute, the way people mark their bodies shares their journey. At the University of Maryland, the meanings behind students tattoos range from honoring a tough time in their lives to a spontaneous decision they made with their friends. According to London, MilkBoy plans to host MilkGirl events annually in the future. “This was definitely one of our most popular events, sitting up there with Drake Bell and Bas. I’m so excited that MilkBoy ArtHouse got to host such incredible talent,” she said. OSYX member and University of Maryland alumna Ara Casey was excited to return to College Park and support the plethora of female performers. “Playing with women is amazing. There’s so many talented people, not just women but nonbinary folk, in the D.C. area,” she said. “The allies and the women on the scene are so incredibly supportive, we’ve actually been able to build really diverse lineups...and it’s also been really empowering.” Members of The OSYX recently created a label to promote women and gender diverse artists, This Could Go Boom! The label is designed to give a voice to those who might otherwise be marginalized. f there’s one thing that college students do a lot, it’s snacking. Everyone needs a little something extra to keep them going between classes or during a long night of studying, but the snacks you choose usually aren’t great for your body, and can leave you lethargic after the sugar crash hits. That’s why it’s important to snack healthily, so you get short-term energy without sacrificing long-term health. Here are some healthy snack swaps you can make that’ll keep you going strong through whatever the semester throws at you. Remember, having the occasional sweet or salty treat isn’t bad for you, so feel free to enjoy a chocolate bar or some chips as a reward for writing an A+ paper. But, for daily snack options that’ll keep you fueled through a long day of classes, consider making a simple swap! Swap bagged popcorn for homemade microwave popcorn Instead of buying microwave popcorn bags, try switching to containers of popcorn kernels and microwaving them in a container or brown paper bag. This is a pretty simple switch, but by cutting out the cost of individual packaging, as well as the artificial flavoring, you can do your wallet and your body a big favor. Another bonus is the amount of control you have over taste. You can go the traditional route of just pouring melted butter over everything once it’s done, mix the uncooked kernels with olive oil and salt for some healthy fats, or throw in whatever you have and try something new. Swap potato chips for vegetable chips Chips can be a great stress food. They’re crunchy, high in salt and fat, and the packaging makes them easy to just grab and go. Unfortunately, they’re generally pretty bad for you, so if you want something healthy with all the craving-satisfaction and convenience of potato chips, switch for vegetable or fruit chips. You can buy them packaged, but if you’ve got time on your hands, or you’re trying to avoid preservatives, you can make your own veggie or fruit chips with an oven or microwave. Swap baked goods for fruit If you’re trying to appease your sweet tooth while staying healthy, fruit is the way to go. It’s just as sweet as a brownie, and it’s jam packed full of vitamins and nutrients to help you get through the day. Dried fruit is a great option if you need something sweet on-the-go, especially if you get some without the additional sugary coating. Swap a chocolate bar for a granola bar Instead of grabbing chocolate, try granola bars instead. It’s important to remember that some granola bars are so packed full of chocolate and sugar that they’re barely better than candy, but it’s easy to pick out some healthier options with the nutritional information. Granola bars are a great way to satisfy your sweet tooth without filling up on sugar: the oats make them a good source of fiber, storing them isn’t an issue, and they’re super easy to just throw into your backpack for whenever hunger strikes. Swap crackers for nuts If you want something savory and crunchy, nuts are a great healthy option. They’re full of protein and healthy fats, and they’re super convenient if you’re in a hurry. The only thing to keep in mind is that nuts can have high calorie contents, so if that’s something you’re concerned about, stick to smaller portions. was stressed. My classes, homework and extracurriculars were all weighing heavy on my shoulders and mind, and frankly, I was ready to go to sleep. Instead of laying on my bed, I chose to lay on a yoga mat for 55 minutes by attending the yoga beginner class at Ritchie Coliseum. Yoga is one of the 13 different types of fitness classes that University of Maryland Recreation and Wellness offers for free to students. The 8:30 p.m. class led by June Solow, a second-year fitness instructor, was the epitome of relaxation. When I walked into the slightly dark room with calming music playing in the background, I immediately felt my stress lessen. Solow started the class by asking each person for their name and how they were physically feeling, as well as having everyone set an intention for the class, like a feeling they wanted to have by the end of the session. I chose “relaxation” as mine and was not disappointed. Solow, a senior public health major, teaches a variety of special yoga events— “full moon yoga,” outdoor yoga, paddleboard yoga in the pool, etc.— but she had never done any yoga before coming to UMD Group Fitness classes as a student. “I just really like offering it because it’s free,” Solow said. “That’s the only way that college kids are going to go to group fitness classes, so I like offering that to people who otherwise probably wouldn’t get that kind of exercise.” Her favorite class to teach is yoga restore and meditate, which is one of the newest Group Fitness classes RecWell offers to students. “I think it really offers space for people to start to practice meditation,” Solow said. Sara Fleischer, a junior marketing and management major, and Erica Weiss, a junior government and politics major, don’t regularly come to yoga or Group Fitness classes but enjoyed the destressing session. “It’s really relaxing, especially to have after a long day of classes,” Weiss said. For challenging workouts, though, Fleischer and Weiss plan to utilize some of the more physically demanding Group Fitness classes. “I used to do Zumba a lot, and we’re also planning on going to body pump this week,” Fleischer said.